Databank is a storage place where the generated/tested strategies are stored with their results. Each mode (Build/Test/Improve/Optimize) has its own independent databank table. For memory reasons Databank cannot keep unlimited number of strategies, instead it stores the selected number of top strategies, for example top 100 or top 1000 strategies. Every strategy result in the Databank can be viewed in the Results screen by using double-click. this button is available only in Retest databank, it loads Strategy projects (.str files) so they can be retested. this way you can save your strategy, you should always save good strategies to a Strategy Project (.str) so that you can work with them later. 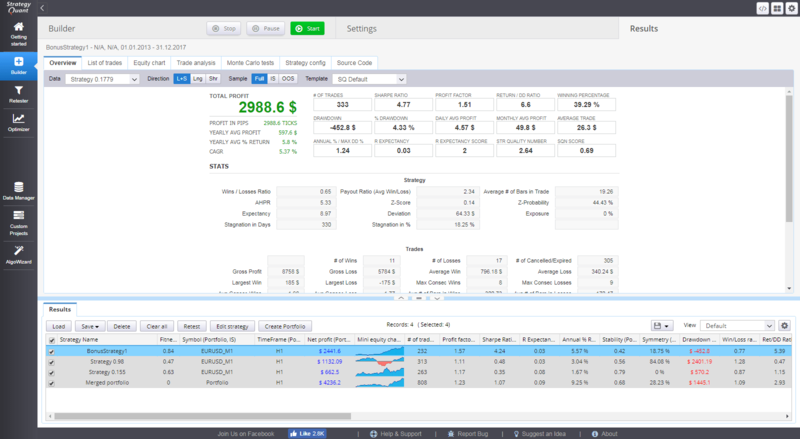 here you can manually edit the selected strategy – either the values of its parameters or the trading rules. it will combine selected strategies to a portfolio – a special report that combines trading results of multiple strategies. You can then check/analyze the results of whole portfolio of strategies. Each row in the table represents one strategy plus, the results of the strategy backtest – number of trades, total profit/loss, Fitness score, etc. are visible in the table columns. Results are divided into In Sample and Out of Sample parts. All the columns in the databank are customizable, you can choose which columns you want to see using views. Overview screen displays various statistics computed from the backtest data. Contains complete list of trades generated by the backtest. If you backtested your strategy on multiple symbols/timeframes, you can switch between the results or check the list of trades for whole portfolio. Displays equity chart of the strategy. Stagnation marker shows the maximum stagnation period – this is the longest period that it took strategy to make new high on the equity. In case of portfolio, it displays charts for every symbol/timeframe tested, plus equity of complete portfolio. This screen displays yearly performance of the strategy plus configurable small charts with trades per hour, day of week, day of month, etc. This screen is empty if you didn’t configure any Robustness Tests. Otherwise it contains equity chart for every robustness test simulation and table of important confidence levels computed using Monte Carlo analysis of simulations. For information about how to use Robustness tests and how to interpret the results, check the Advanced functionality and Cross checks – robustness tests and analysis section of this guide. This screen displays current settings of the program versus settings that were used when the strategy was last time backtested/generated. The differences are highlighted with red color. To quickly load settings from the strategy you can use the button Apply Strategy Settings. This will load settings from the strategy and applies it to the selected program section. Source code tab is where you’ll get the result of the program. For every selected strategy it generates selected source code. human readable pseudo code of the strategy. You can see the strategy logic and you can use it for manual trading. the EA code for MetaTrader. You can save the EA code to MetaTrader/experts directory and you’ll be able to run your new EA in MetaTrader. Support for NinjaTrader will be added later. by checking this checkbox, you can generate code where all the number constants like indicator periods, comparison constants etc. will be parameterized – a parameter will be added for every constant. This allows you to optimize your EA in MetaTrader, or test it with different parameter values. 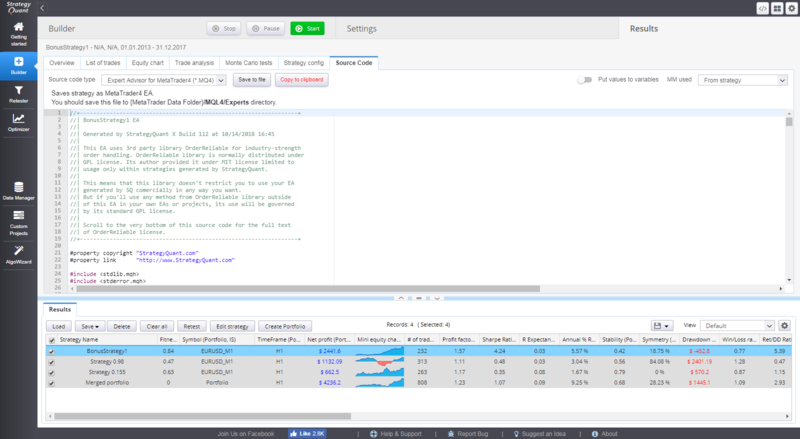 this option allows you to include money-management settings from builder/retester/optimizer into the strategy source code.